Can you spot what’s wrong with this picture? This picture was taken back in April. I tried to complain about it in store but a member of staff wandered off to get the Duty Manager and never returned. Then I wrote a letter to Head Office but after investigating why no one had replied after a month I've now been informed they have no record of it. At the time I was upset about the product placement. 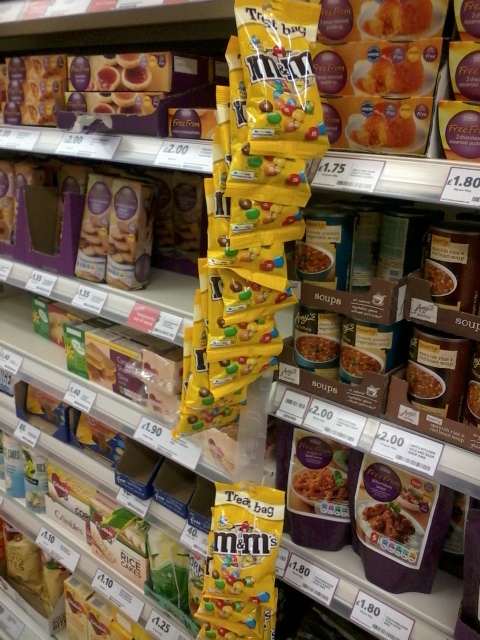 Which bright spark decided it was a good idea to hang three rows of Peanut M&Ms in the Free From Section? There they were taunting me next to the Dairy Free chocolate buttons. My other complaint with them was they had sent me Gluten Free bread coupons, *sigh*.....need I say more. Regular followers will understand my woes as I'm not Gluten Free but I do have other food allergies, funnily enough those allergens are present in Gluten Free Bread, so I can't eat it even if I wanted to. I now spend more money at my local health food store since the supermarkets jumped onto the Gluten Free market. There are only one or two products which are suitable for me on the dedicated Free From shelf. My boyfriend is allergic to nuts so obviously we are very careful with everything we buy. So when you go to a free from section and see this it just highlights how little thought someone has put into it and tells you how little they really care as well! That's nuts! And terrible of them to not reply to you. They need to be more conscientious of their customers' needs. I don't know what to say. It's a very stupid thing for them to do.